This passion fruit cheesecake has a wonderful texture with a tropical fragrant that makes an easy, elegant summer dessert. Cheesecake. Oh how I miss you! It has been years since my last attempt at baking one. The cheesecake landed in the trash and I got a nasty burn on my arm while removing it from the oven. Since then, I stayed away from cheesecake. Well… Until a few weeks ago! I finally found what I was looking for. A recipe for passion fruit cheesecake! My first try turned out quite tasty and garnered compliments from my colleagues at work. But, I was not satisfied and decided to muck around with the recipe. I substituted the mascarpone cheese for all of the cream cheese and it turned out too much like a mousse. The consistency was all wrong! So I mucked around some more. Version 3 resulted in my idea of a perfect cheesecake hence the name for this post. I could not contain my excitement as I removed it from the springform pan. 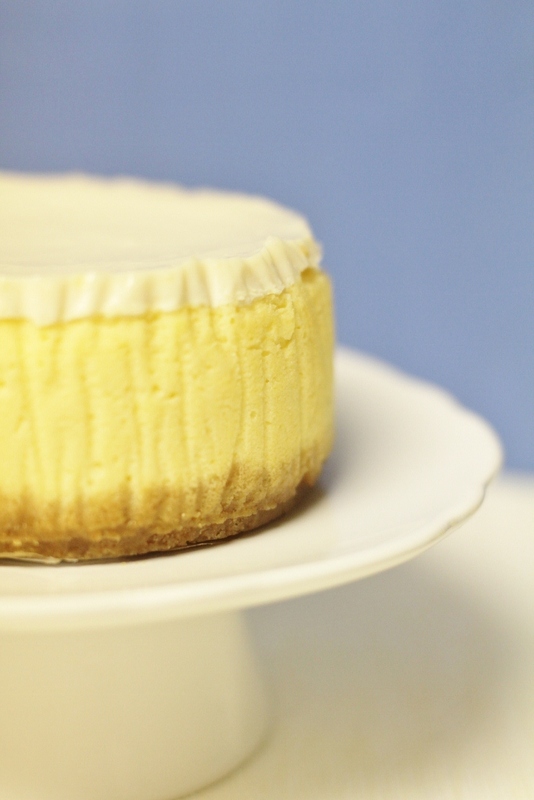 The passion fruit pulp gave the cheesecake a beautiful pastel yellow color. Tasting time! Light. Creamy. Almost like a cloud! Crunch! Oh wait! I had forgotten that I used all of the passion fruit pulp including the seeds leaving nothing wasted. They added a nice texture. A little surprise for your bite! 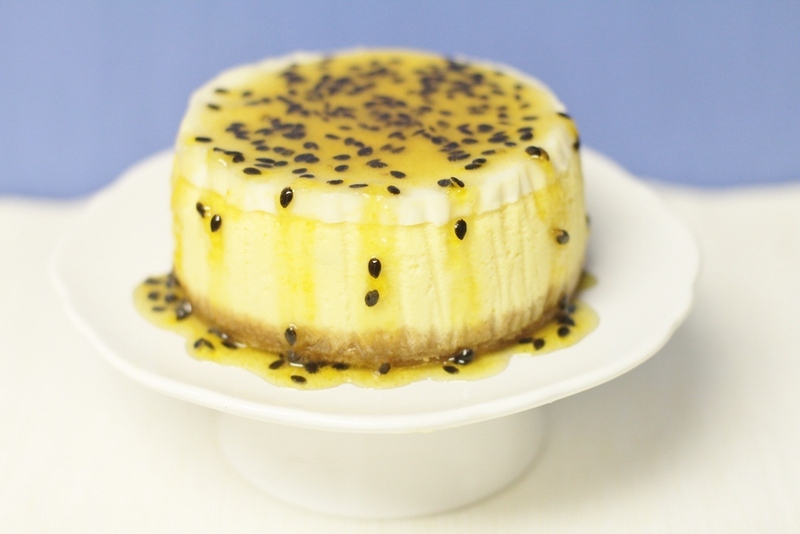 If you prefer your cheesecake smooth, make sure you strain the passion fruit pulp. The unique flavor of passion fruit shined through. Passion fruit is very fragrant and blessed with a hint of floral, citrus, and a lightly sweet flavor. The more I work with passion fruit, the more I fall in love with it. I was in cheesecake heaven. Forget about those cheesecakes at Cheesecake Factory and make your own. 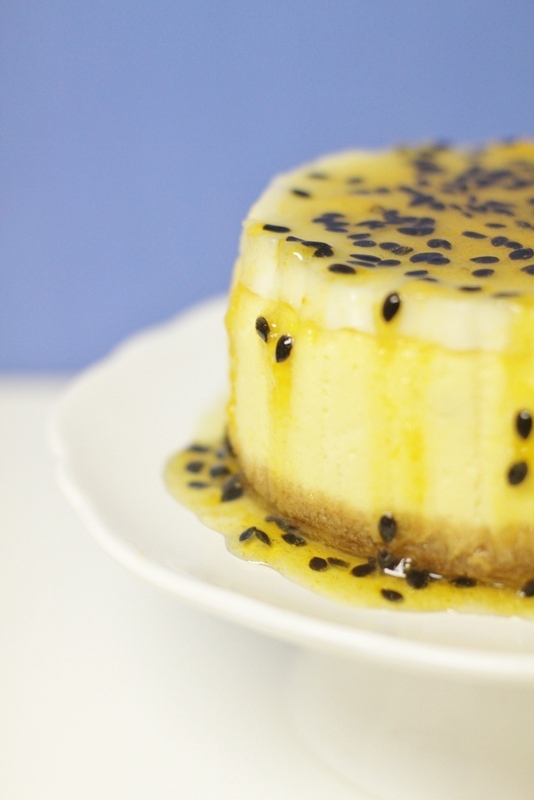 Better yet, experience a passion fruit cheesecake! In a large bowl, combine the crumbs, sugar, and butter and stir until well blended. The mixture should stick together when squeezed firmly in your hand. Transfer the Graham-cracker mixture to a 9-inch springform pan and press the mixture firmly onto the bottom of the pan. Bake until golden brown, about 8-10 minutes. Remove from the oven and let it cool. For the filling, in the bowl of a stand mixer, beat together the cream cheese, mascarpone cheese, powdered sugar, and vanilla extract until thick and creamy. Add the eggs, one at a time and continue mixing until the mixture is well blended. Add the passion fruit pulp and continue beating, scraping down the sides of the bowl as needed. Add the sour cream and beat for another 5 minutes. Pour the filling into the spring-form pan and bake in the oven for 45 minutes. It might still jiggle a bit. Let it cool for 10 minutes. For the topping, combine sour cream, sugar, and vanilla extract and beat until the mixture becomes creamy. Pour the sour cream mixture on top of the filling and bake until the top is firm but still soft to the touch, about 15 minutes. Remove the cheesecake from the oven and let it cool for 30 minutes. Transfer the cake to the refrigerator and chill overnight. For the syrup, place the sugar, water, and passion fruit pulp in a saucepan over low-medium heat and boil until the mixture volume is halved or until syrupy, about 20 minutes. To serve, run the edge of a warm knife along the inside edges of the springform pan. 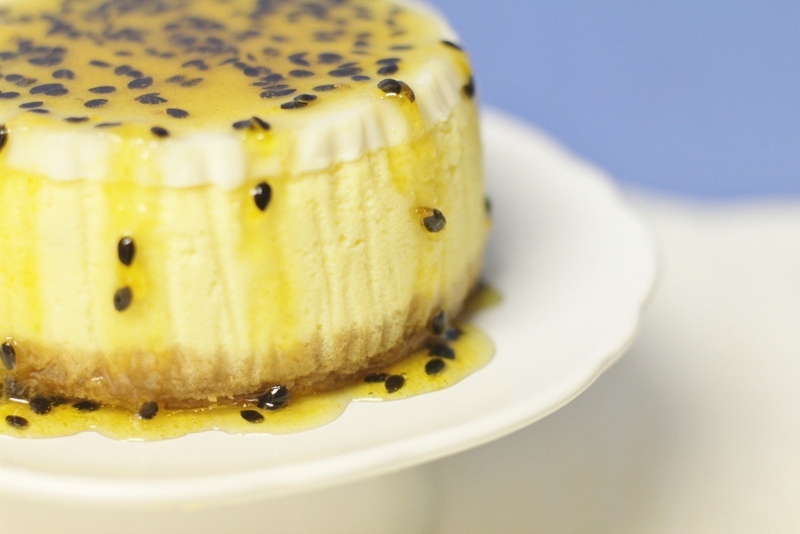 Remove the cheesecake and top with passion fruit syrup. If you want a smooth texture, strain the passion fruit pulp before using.